With use over time your sharpest knife can begin ripping through your food rather than sharply cutting through it. Your knife’s sharp point begins to dull, but not necessarily because it loses its point. Knife blades also tend to lose their straight edge over time. This may not be visually apparent, but the results are evident. The resistance just makes food harder to cut. Before you begin sharpening your knife, try straightening your knife blade instead using the best honing steel. A hone is NOT a knife sharpener. The typical it is a fairly long (10 in. — 12 in.) thin (approx. 3/5 in. — 1/2 in.) steel, diamond, or ceramic rod used to smooth and straighten the longitudinal (microscopic) edge of your knife blade. This tool is not intended to remove the blade’s metal to create a sharp edge. It simply straightens an already sharp edge that has become ever-so-slightly bent over to one side. Hone essentially realigns your knife’s edge. Honing steels are compared according to their type, diameter, overall weight and handling, and their grit. 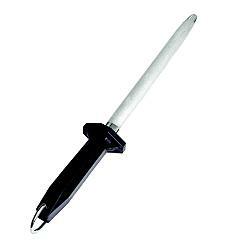 The Green Elephant Knife Sharpening Rod is a high-quality, lightweight, durable ceramic hone. It has a sturdy 0.6” diam. ceramic rod and ceramic grit rate of 1500. The Green Elephant has a comfortable, ergonomically-designed, polypropylene handle. 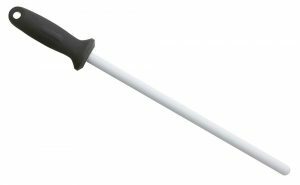 Between the ceramic rod and ergonomic handle is a silicone shock absorbing, vibration-resistant seal. A rubber end cap protects the rod from damage in the event it is accidentally dropped. This tool works equally well for smaller pocket knives as well as larger carving knives. It is ideal for honing hunting knives and has an adequate hardness (9 Mohs) needed for honing Japanese and German knives. The Green Elephant is easy to use, maintain, and clean. Just hand wash with regular detergent and air dry. All ceramic hones should be handled carefully. They are more brittle than other hone types and break or bend more easily when used on harder knife blades. The Utopia Kitchen honing steel is a versatile, easy to use, durable. It has a sturdy 0.5” diam. carbon steel-plated rod and fine grit rate. The Utopia Kitchen tool has a slip-resistant, ergonomically-designed, rubber-bottomed handle. It comfortably fits in either (left or right) hand. This carbon steel-plated w/nickel chrome hone has a fine surface that helps prevent damaging your knife’s cutting edge during honing. It works equally well on any blade size and/or style including standard steel, ceramic and serrated blades, and scissors! The Utopia Kitchen tool is durable, safe and easy to use, maintain, and clean. Hand wash with regular detergent and air dry or use a cooking oil-soaked non-woven cloth to and dry it. This tool is NOT dishwasher safe. 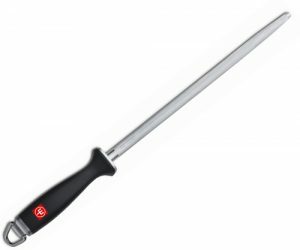 The deluxe Wusthof 12-inch long sharpening steel is a quality, lightweight, larger-shafted tool. It is a sturdy 0.6” (3/5”) diam. with medium to fine grit. This tool hones your blade, resetting the dull edge of your knife as it realigns the blade. (Per reviews, this steel is not intended to sharpen your blade. Rather, it “reconditions” it). This Wusthof honing steel’s larger diameter rod also gives you a more generous and comfortable slip-resistant plastic handle that allows a better grip for quicker and easier honing. A loop is attached to the handle for hanging so the tool will be conveniently within reach for routine knife honing maintenance. It is recommended for honing Classic Knives. The magnetized steel attracts microscopic metal particles and fibers that are removed from the knife blade as it is honed, so they are less likely to become embedded in food. The Wusthof tool is as easy to clean as it is to use. A wipe with a damp cloth or paper towel is all that is needed after each use to remove microscopic particles collected during knife honing. The Winware sharpening steel is an inexpensive, quality, long-shafted honing tool. It has a sturdy 0.5” (1/2”) diam. grooved, coarse grit rod. This lightweight magnetized tool hones your blade, effectively realigning the edge of your knife. Contrary to what the name implies, this hone is not intended to sharpen your blade, just “reconditions” it. 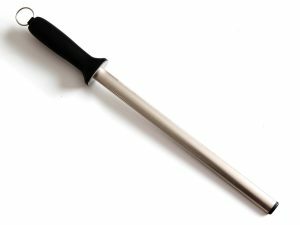 This tool has a comfortable 5-inch, secure-grip, plastic handle that allows quicker and easier honing. A hanging loop is attached to the handle for conveniently locating it within reach for handy, routine knife honing maintenance. It is not recommended for serrated knives but can hone Japanese steel and pocket knife blades. The magnetized steel attracts microscopic metal particles and fibers that are removed from the knife blade as it is honed, preventing them from becoming embedded in food. The Winware sharpening steel is as easy to clean and maintain. Simply wipe with a soft damp cloth or paper towel after each use to ensure any microscopic particles collected during knife honing are removed. The Messemeister 12-inch long sharpening steel is a quality, lightweight, ceramic honing tool. It is a durable, industrial-strength 0.6” (3/5”) diam. with a coarse, abrasive, great rating. This tool moderately sharpens as it realigns/reconditions your knife blades. It is an ideal preventive maintenance knife honing and sharpening tool. 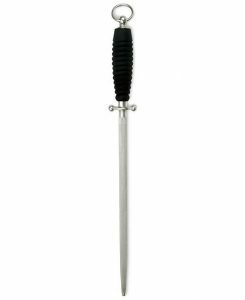 This Messemeister tool larger diameter rod also provides a sturdy, soft, ergonomically designed handle and comfortable grip for quicker and easier honing. 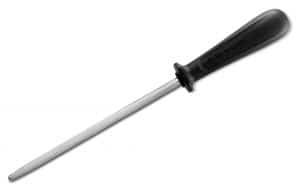 A rubber end cap protects the rod from damage in the event it is accidentally dropped. It works equally well on any blade size and/or style including standard steel and ceramic and serrated blades. A plastic sleeve is included to protect your tool between uses. The Messemeister ceramic sharper steel is as easy to use. Proper cleaning is imperative. Gently cleaning with a magic eraser is suggested. The Victorinox Swiss Classic Honing Steel is a high-quality, industrial-strength, NSF-approved tool. It has a sturdy 0.6” (3/5”) diam. vertically-grooved rod. Its brushed chrome-plated steel provides extra hardness and stain resistance. This lightweight tool moderately sharpens as it realigns/reconditions your knife blades. This Victorinox Swiss Classic tool is handled and supported by its patented, slip-resistant, textured Fibrox handle. The handle is ergonomically designed to provide more comfort, control, and the best honing results. A hanging loop is attached to the handle for conveniently locating it within reach for routine knife honing maintenance. This sturdy, well-balanced 10″ hone can capably sharpen/hone nearly any knife in your drawer. It works equally well for large butcher knives as well as small kitchen knives. This tool is as easy to use, easy to clean, and easy to maintain. Simply wipe with a soft damp cloth after each use. The ZWILLING J.A. 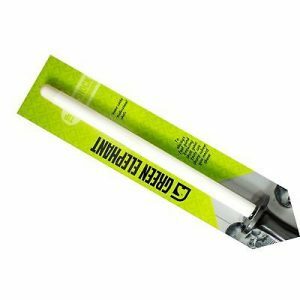 Henckels 12-inch long professional stainless sharpening steel is a durable, high-quality honing tool. It is a sturdy 3/8” – 1/2” diam. with medium to coarse grit. This lightweight tool realigns and reconditions your knife blades. Contrary to its name, it is not intended for sharpening your blades, only for realigning/reconditioning them. This ZWILLING J.A. 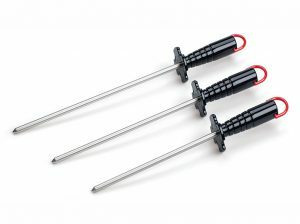 Henckels steel-alloy honing rod has an attractive and comfortable, ergonomic synthetic handle with a steel finger guard that allows a safer grip for quicker and easier honing. A metal loop is attached to the handle for hanging so the tool will be conveniently within reach for routine knife honing maintenance. The ZWILLING J.A. Henckels sharpening steel is a streamline, professional-type honing tool suitable for Japanese steel and other high-end knife blades. It is as easy to use and maintain. A wipe with a damp cloth after each use is all that’s needed. The rule of thumb is to purchase honing steel that is made of a harder material than the knife (i.e. : Western-style Japanese) it will be used on. It is important to be aware of the downsides of each type of honing steel. 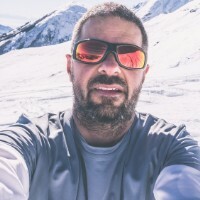 For example, stainless steel hone roughness can wear knives down quickly; ceramic hone may be more brittle and require care when using, and diamond hone may wear out quickly. Stainless steel hones are the recommended “classic” type of honing tool. Stainless steel hones are typically longer, more slender, and have longitudinal grit ridges running its length. They traditionally accompany kitchen knife sets. Rods may be ridged or smooth, square or round. Ridged/harder rods are higher-quality but they are not durable enough for Japanese steel and they wear much faster as a rule. The ceramic hones are harder than stainless steel and suitable for Japanese steel blades. It is also more brittle so it can break if you are too rough using it. Ceramic honing steel tends to gently remove a bit of the blade as it smoothes and straightens. The blade is slightly sharpened as it is honed as a result. The ceramic hone is safe for frequent honing between sharpening. A diamond hones is the hardest hone of all. It is traditionally a butcher’s honing tool. It also tends to remove some of the blades and sharpen it, as it is honed. Diamond honing steels are more abrasive than ceramic hone and are not recommended for daily use. Coated steels appear smooth but they also contain abrasive diamond particles embedded in their hone. Some complaint about the diamond coating quickly wearing off or falling off. reduces the need to continually sharpen your knife (preventive maintenance). The length is the most important feature. It may seem obvious, but the longer the rod’s length, the more grit you have to pull your knife along to smooth and straighten it. The rod should be at least 2 inches longer than the longest knife you plan to sharpen. The length is more important when honing slicers and chef’s knives than smaller paring knives! A 12-inch rod (not including the handle) is recommended as a satisfactory, standard workable length. Good quality tool handles help make sharpening your knives faster and easier. Some honing steel handles are ergonomically designed to provide easier and more controlled gripping for faster honing. Others are designed for comfort. All handles are designed to help ensure safe operation. They are slip-resistant and may have a thicker diameter to aid a firm grip. Some honing steels are lighter-weight and have better balance than others. Overall length can contribute to the honing tool’s weight and balance. 1. Question: How often to use honing steel? 2. Question: How to use knife honing steel? 3. Question: How to hold honing steel? 4. Question: Does honing steel sharpen knife? Honing steels don’t sharpen, they merely ‘true’ the edge, straightening out that last hundredth of a millimeter. 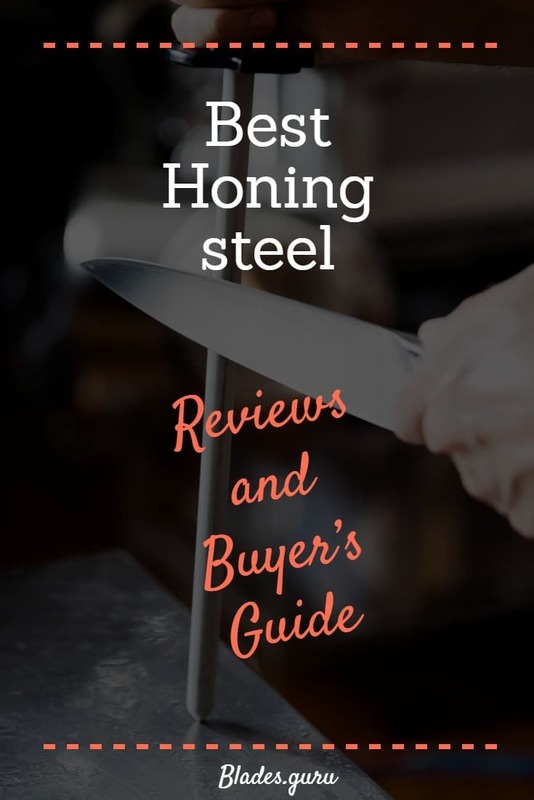 Honing steels are not knife sharpeners! They are used to straighten and recondition sharp edges that have been over-used and fold over, creating a dull cutting edge. The reconditioning itself tends to inadvertently regain some of the knife blade’s sharpness. Honing steel are also an effective way to extend the life of your knives. Honing your knives, scissors, and other sharp edges is a faster and easier preventive maintenance means of getting the most and best results from your sharp-edged utensils. You will need to sharpen your knife less often if you regularly hone the blade before and after using it. The “best honing steel” winner from those reviewed is the Green Elephant Knife Sharpening Steel. It has most of the features desired in a honing steel. It is lightweight, durable, ceramic that offers adequate hardness and abrasiveness for honing hunting knives and higher-end Japanese and German knives. The ergonomically-designed, shock absorbing, vibration-resistant seal allows easy honing without tiring your wrist or hand. 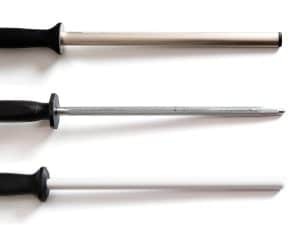 The rubber end cap (at the tip of the rod) is a safety feature that helps protect the honing rod from shattering should it accidentally be dropped. Following the Green Elephant are the versatile Utopia and the Messermeister hone. They are equally durable, ergonomically comfortable, and capably hone all types, styles, and sizes of knives and sharp edges.